Advocacy for birds and all wildlife promotes conservation through education, anchored by science, best practices and hands-on restoration work. It's the theme connecting all we do. The morning's catch along our adopted section of the creek. Like to help out? Contact us below. Elementary kids, their parents, and neighbors are curious to learn about the cool things that call South Creek home. That's how it started. Muncipal projects were underway to mitigate flooding by channeling stormwater via concrete, while greener alternatives weren't considered for this birdy little oasis in mid-town. 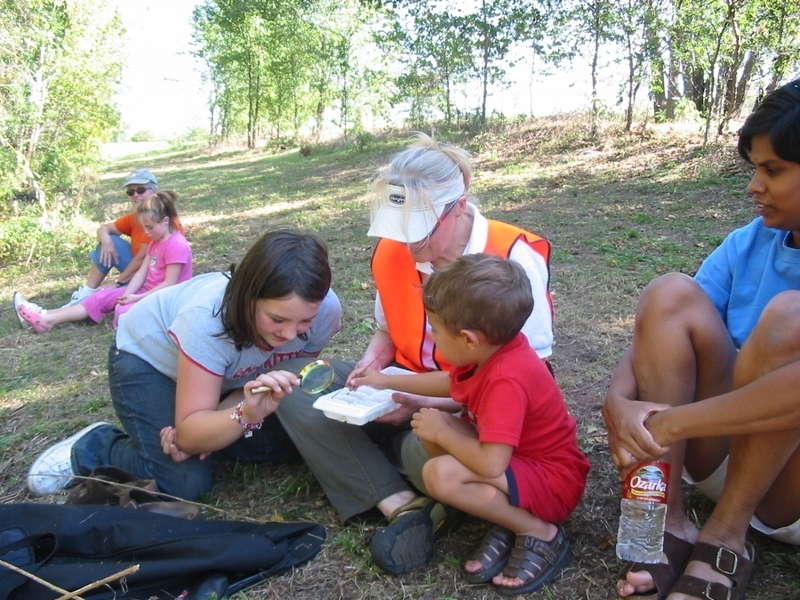 GOAS volunteers coordinated trash and vegetation debris removal after heavy rains, with volunteer participation from Ozark Greenways, Holland Elementary kids, MSU college students, Wal-Mart employees, and more. Agreements with the City and Parks Departments led to a native prairie installation, tree and brush trimming, and removal of invasive species all done by volunteers. In 2016, James River Basin Partnership spearheaded a project to remove the paved stormwater conduit between Campbell and Kansas replacing it with green, engineered stream flow and appropriate wetland plantings models. Volunteers add mulch to the trails leading to the bubbler. The bubbler and naturalized setting attract a variety of birds. In 2010, our chapter proposed to install a naturalized landscaping demonstration at the park made possible by an all-volunteer work force. The central attraction is a bubbler water feature, which required a water source. Within three years the location was approved and work began to remove invasive plants, build a mulched interpretive trail, and surround the bubbler with rustic seating. Soon after, native trees and perennial plants were added, including a wildflower garden. Volunteers join us for work days twice a year to maintain the landscape and replace mulch. Parkview High School honors program students, Expedia employees, and Springfield Plateau Master Naturalist volunteers have helped - you can too! The native plants attract butterflies and insects which attract birds. Come on out and enjoy the bubbler, birds, and nature at the park! Viewing birds and wildlife up close can open kids' eyes to the wonders of nature and the outdoors. An intimate view inside nest box 13. These Bluebird chicks fledged within a few days of their portrait. The Fellows Lake Trail was established in 1984, followed by the Lake Springfield Trail in 1998. Recently a new nestbox trail that replaced scattered boxes was installed at Close Park. Since then these trails have been monitored continuously, March through August. Bluebird numbers declined during the first half of the 1900's due to the spread of introduced European Starlings and House Sparrows which out-competed Bluebirds for nest sites. The use of DDT and other pesticides increased after WWII, impacted insects, and concentrated in the food chain all the way to top avian predators, including eagles. 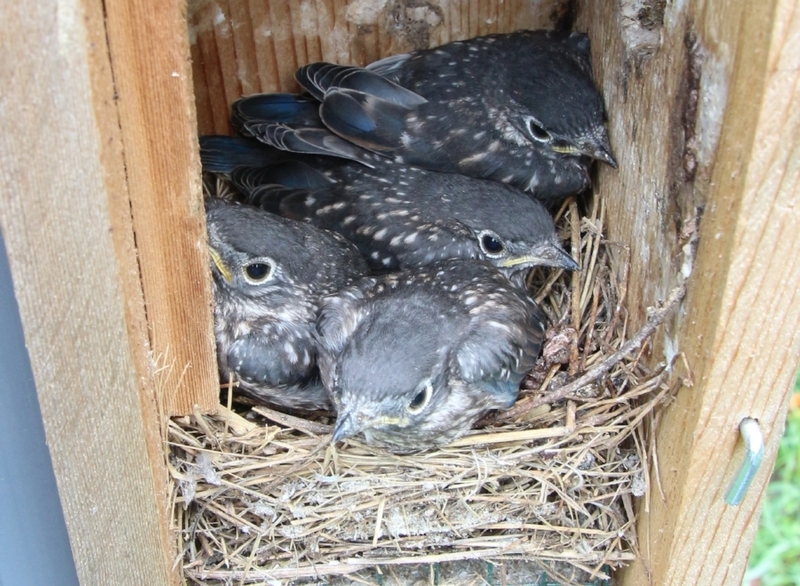 Installing Bluebird nest box trails has aided the recovery of the species. Want to help monitor one of our trails, or bring kids and grandkids along while we check the boxes each week? Send a message to us at info@greaterozarksaudubon.org. The Watershed Center's twin towers are an attractive solution to increase the number of sites where swifts can roost. Four towers are available for migrating Chimney Swifts at Close Park, echoing the Mizumoto Japanese Garden design. Chimney Swifts were never numerous, nesting in upward-facing broken tree stubs. Populations expanded during the industrial revolution when factories and buildings required large vent flues. As chimneys were capped or lined with metal, swift numbers plummeted. In 2016, our chapter erected towers at two sites: The Watershed Center at Valley Water Mill Park, and at Nathanael Greene-Close Memorial Park. Sometimes referred to as flying cigars, swifts congregate in large numbers to roost in uncapped chimneys, and chimney-like towers, where they stage before migration. We host the Swifts and Sundaes field trip each fall to count Chimney Swifts returning to roost, then head to Andy's Frozen Custard to kick-off our chapter's new fall schedule. Join us! Litter warriors deliver knockout punch to unsightly trash. Does a Short Walk Doing Something That Makes a Difference Sound Fun? The GOAS Adopt-A-Street Clean-Up started in 1990, and is another way we collaborate with community partners. Oh, and you get those smart watch steps in while helping out! Make new friends or join old ones and bring a pair of gloves. The trash bags will be furnished. Purple Martin populations have suffered declines similar to Eastern Bluebirds and Chimney Swifts: Competition for nest cavities, toxins, and the built environment. These social, colonial birds prosper when given high rise apartment housing, combined with monitoring to remove Starling and House Sparrow nests. GOAS-maintained Purple Martin colony was at near capacity. All but two of 14 apartments were occupied. Osprey parents raised three healthy youngsters in 2018. When a large Osprey nest caused a fire, destroying the nest, and resulted in a power outage, Empire District Electric Cooperative sought a solution that protected power transmission and Ospreys. GOAS collaborated with Empire District Electric, hatching a plan to relocate an Osprey nest from a Stockton Lake transmission tower to a nest platform, complete with a nest cam! Within just days, the Ospreys reclaimed the nest. The Goal? Reduce power outage risks, and conserve the small number of breeding Ospreys in Missouri: Win-win solutions through joint efforts. Three young fledged this summer - see live footage. Activity will start again in late March.